“Hate will not win. 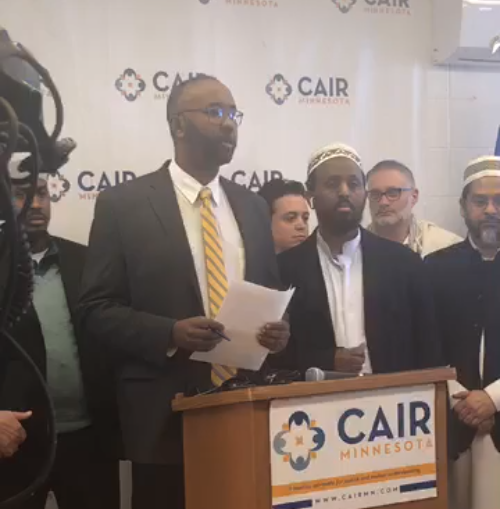 Our communities are resilient,” said Jaylani Hussein, executive director of the Council on American-Islamic Relations (CAIR) in Minnesota in response to the Christchurch, New Zealand mosque shootings. CAIR-MN joined leaders around the world in expressing shock and sadness over the massacre and condemning the hatred that spawned it. “This is an attack on the faith community, and an attack on any place of worship is an attack of all places of worship,” said Hussein at a press conference. Hussein called on local authorities to offer extra protection for Muslim communities. He also condemned President Donald Trump’s “rhetoric” for helping to incite anti-Muslim sentiment. Rep. Ilhan Omar, D-Minn, one of the first Muslim women ever elected to Congress, and a target of anti-Muslim sentiment, herself, took to social media on Friday to express her shock over the shootings. Thank you all for standing in solidarity with our community in this dark and fearful time. Jummah Mubarak to all. The murderers in NZ cannot stop you from fearlessly, faithfully and lovingly embracing your neighbor. Could be the best way to overcome their hate. Ellison tweeted out a link to a Muslim Solidarity Gathering at Dar Al Farooq Center in Bloomington. The center was the target of a 2017 bombing by members of an Illinois militia group. Both the Minneapolis and St. Paul police have announced increased protection around local mosques and other places of worship in response to the attacks. The Muslim Solidarity Gathering takes place Sat., March 16 from 2-4 pm at the Dar Al Farooq Islamic Center, 8201 Park Avenue South in Bloomington. Also, CAIR-MN will host a Challenging Islamophobia Conference on Thurs., March 28 at Metropolitan State University. The event was planned prior to the New Zealand shootings. The MSR will continue to follow this story as it develops.